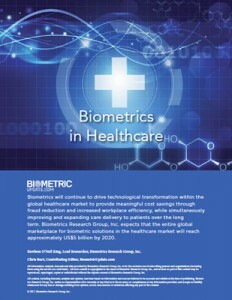 This white paper by Biometrics Research Group, Inc. provides an overview of the healthcare biometrics market (PDF). Biometrics will continue to drive technological transformation within the global healthcare market to provide meaningful cost savings through fraud reduction and increased workplace efficiency, while simultaneously improving and expanding care delivery to patients over the long term. Biometrics Research Group, Inc. estimates that the entire global marketplace for biometric solutions in the healthcare market will reach approximately US$5 billion by 2020. Biometric use will reflect the increasing demand for healthcare fraud prevention and cost containment in the United States, along with the need to improve patient privacy and healthcare safety. Solutions that can meet both regulatory and usability demands will drive increased adoption for both government-delivered and private healthcare services in the U.S. and throughout the world. Our Special Reports are sponsored by leading firms within the biometrics sector and this report is sponsored by HID Global.